Maybe something about the World Cup. In this date, Brazil begin to play in the Cup. I vote for new album, or dvd releases, or new dates even for beyond Europe. JMJ likes to tease us, a lot. Has Jarre become a stalker now?? Just having read the opening concert will includes Shakira, a Black Eyed Peas, Alicia Keys and John Legend. Closing concert by Andrea Bocelli and Bryan Adams. Here's hoping it's news about a new album. Personally, I think it is a big typo error. Seatwave are not really a 100% reliable source But then again, it would be lovely if it becomes true and that he will play those dates. Still no dates of his on the Paris Olympia website, but don't the dates happen to coincide with the Michel Sardou set of shows? It was discussed in the In-Doors World Arena Tour 2009/10 topic on page 153. Yep and I am good at keeping them a secret. To be fair, it was JMJ who hyped it up by teasing us. While were still at the fair he only gave us a date, we jumped to conclusions. That's what he wanted. It's a mind game. He wants leave a lasting impression with his words. You all need quoting lessons. I tried, obviously not hard enough. Hopefully this format works for him.. I think it does suit him.. just a line at at time, in between his busy schedule. Of course...the day before my birthday. Heâ€™s checking that they stock all his music. @chronology2 thank you and it was nice meeting you!! Isn't it a strange world cup? Best team aren't the best anymore or has all others improved ? I didn't know he was interested in soccer... it is a strange world cup indeed. He's right. Indeed some of the best teams disappointed but also some small teams raised their level. Sure I've seen that, but that doesn't make him a football fan. True but I think he follows when necessary. I think this is a answer a a campaign called the Digital Life Sacrifice. Celebrities including Lady Gaga and Justin Timberlake will sign off Facebook and Twitter to raise money for AIDS charities, in a campaign called the Digital Life Sacrifice. The stars, who boast some of the highest numbers of online followers, have been shown lying in coffins in advertisements supporting the campaign to represent their digital deaths. They will sign off on 1 December, World AIDS day, and only log back on once one million dollars has been raised for AIDS charities. Keep a Child Alive president Leigh Blake has said Lady Gaga will likely â€œraise it all by herselfâ€�, with the singer attracting over 7 million followers on Twitter and nearly 24 million Facebook fans. Each celebrity has filmed a video of their â€œlast tweet and testamentâ€� in a bid to collect donations, which will be made online and through text messages. Other stars taking part include Alicia Keys, Usher, Kim Kardashian and Katie Holmes. Could they not make their minds up what to name it? AFAIK, he's still using that - it's linked with mine! That photo reminds me so of a scene from the excellent movie Bad Taste. Hehe, the first movie of director Peter Jackson. He, family and friends played in it for reduce the costs! Morning coffee with Victoria (@LittleBoots). Zero Gravity and Watching You have sold out. At the moment, only Conquistador is in stock. Let's making GAFA listening to us..! a clear message from artists can change everything. Will someone be able to post the Q/A from JM here ? He answered one of my questions! • Billboard Dance Jean-Michel -- as an electronic music pioneer, what are your thoughts on electronic dance music's current boom in popularity? • Jean-Michel Jarre I've always been convinced that one day, Electronic Music would be the most popular way of composing, performing, producing & distributing music worldwide ! • Billboard Dance Jean-Michel -- how do you balance analog gear with in-the-box digital plug-ins on your new material? • Gonzalo Schafer Canobra Dear Jean-Michel Jarre. Hello, I am from Chile I have 16 years, I wonder if Jean-Michel plans to do or would like to do a concert in South America or some tour to promote his new album that is on the way? • Jean-Michel Jarre Visiting South America is definitely part of my future plans ! • Billboard Dance How did you each become familiar with each other's music? • Daniel Radu Jean-Michel - What keeps you really young in spirit, mind and body ? • Sven Syntetics Jean Michel: Will be there ever a Jarre Synthesizer like Novation did with Moroder? • Christophe En Katherine Coussement Hello, Jean-Michel. What do you like about the music/remixes of Steve? Why you choose him to make a remix of Glory? • Jean-Michel Jarre I have a lot of respect for Steve, both as a musician and producer. He has an instant recognizable sound and I was convinced he would be able to convey and enhance both the emotional and dynamic elements of the tracks. • Antoine Gasnier Jean-Michel What do you think of the new french touch generation with Madeon etc... ? • FJ Okkerse Jean Michel..when can we expect your new album in stores? And will there be a tour...in the Netherlands perhaps? • Meishel Menachekanian Jean Michel: With so many collaborators on the current project how did you maintain a flow for your upcoming album? • Krzysztof Zieliński Hello Jean-Michel, I have two questions for you. When did you get an idea of creating album with many collaborators? Was it your dream to compose with thease artists? • Matthew Stringer Question for JMJ: You have an Arp 2500, it features prominently on studio shots and on stage. Whilst Moogs and whatnot are commonplace on records and they have a signature sound, the 2500 has always had that air of mystery. I've never seen a clip or heard a piece of music that has ever been created on one (The Who fed an organ through its filter but it wasn't producing its own sound), just FX and drone sounds. Because of this I've found the instrument fascinating, which leads to my question: On what pieces of music can we hear the 2500, is there a particular patch or melody you've recorded that is distinctively from that machine that features on one of your songs? Thanks for the music, Oxygene changed my life! • Vitalii Vovk JMJ: will you collaborate with Michel Granger on future album artwork? • GB Paris Jean-Michel Jarre -- Another question : did you ever think about conveying your knowledge ? such as teaching in a school or collaborating with a keyboards brand ? • Bo Andersen question for Jean Michel: has the eminent 310 been used for this and the other collaborations? • Duncan Walls Hello Jean Michel. This year marks the 25th anniversary of your Paris La Defence concert. Have you any plans to release this on DVD/Blu-Ray, and indeed have you any plans for any other releases from your back catalogue of concerts/shows? Kind regards, Dunkie (JarreUK). • Geoff Vane JM - would you concider working with Air? Or the Chemical Brothers? And how about the 8 bit computer scene, where your name is mega big? 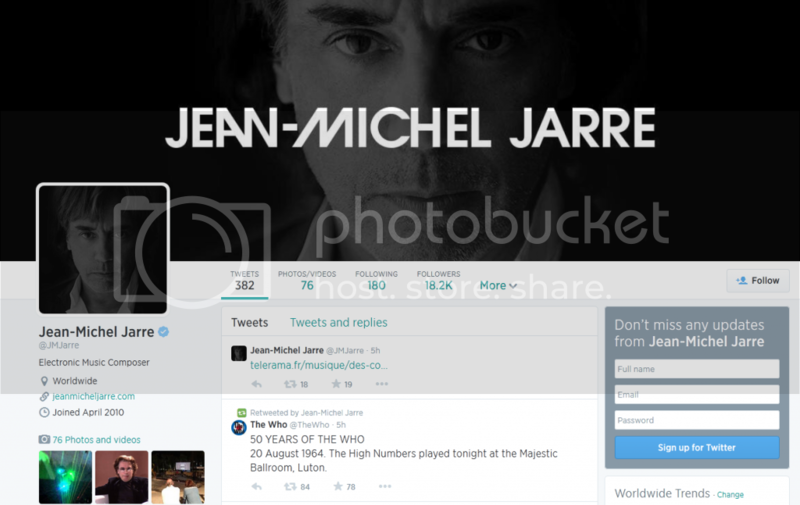 • Jean-Michel Jarre Why not - lots of respect for both acts ! • Dan Tearle Jean Michel - going back to your earlier works, and an exciting time in the development of the synthesizer; on albums such as Equinoxe which had such wonderfully diverse sounds, what proportion of these do you think were 'happy accidents' and how much by design? And do unexpected sounds still get created today, or is it more like an experienced painter who can mix any colour instantly based on experience? • Barış Ensari Jean, you talked about a possible Royksopp collaboration back in 2010 when you played in Bergen. Will it ever happen? • Bo Andersen question for both: how do you connect your musical future and past during your collaboration? • Matt Mowles Jean-Michel, What album of yours do you hold closest to your heart and what do you think is the favourite of your fans? Mine is Zoolook ...a masterpiece! • Francisco Cerda Sepúlveda to both of you, great people: do you know another artists who worked with the timeless ARP, as Todd Terje? Are you still interested in using it or are another modern machines who caught your attention already? thanks! • Jean-Michel Jarre I'm still using my ARP 2600 & 2500. It's like a steinway, a stradivarius, it's timeless ! • Julliene Aisha do you have plans on having a tour this year? any future collabs? • Jean-Michel Jarre It's always great to be on stage and I'm looking forward to it. • Alitz Tzadkiel Jean-Michel Jarre, are you planning other collaborations like the one with M83? • GB Paris Jean-Michel Jarre -- What do you think about the analogue synths revival ? 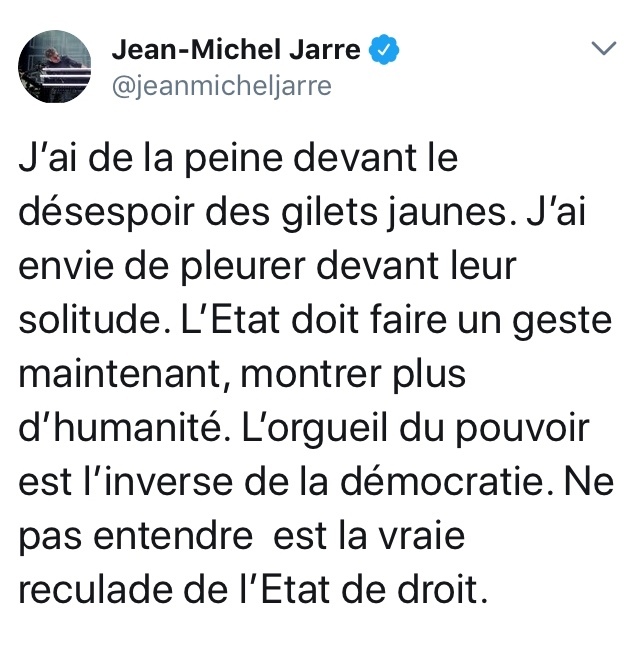 • Cristian Gabriel Jean-Michel Jarre. How did you manage to create Oxygène so out of the blue? • Jean-Michel Jarre It was not out of the blue, but something I had in mind since I've been in contact with Electronic Music. • Daniel Löwen Jean Michel - a musical dream of yours for the future? • Matt Boardman Jean-Michel, a lot of todays electronic music is very bland and unoriginal. Do you think the golden age of original pioneering electronic music is over? • Kanta Devi Jean-Michel Jarre and Steve Angello The lyrics to Glory, what is the story behind them? • Jean-Michel Jarre Doing Electronic Music is belonging to the other land, everybody is welcome. Glad to see he answered Dunkie's question about a PLD re-release. yeah, he was very clear about that. Thought I would mention it as I do not see them on your list. Today France should grant Julian Assange political asylum. Aujourd'hui la France devrait accorder l'asile politique à Julian Assange. Have some exciting news coming soon. Are you ready? I'm proud to have inspired @SoundhuntersExp, a smart interactive music experience! Capture & remix the world here: http://arte.tv/soundhunters . Humor is very important in his life. At the end of the day as long as you have fun, that’s what matters. #techtuesday My favorite iPhone app was Photo Effect. What other apps should I try - photography or otherwise? Je pense à mes amis Bruxellois et à la Belgique. Wow Eno as well ! I’m with @Billboard to #DisarmHate! Visit http://billboard.com/letter to learn more about stopping gun violence. 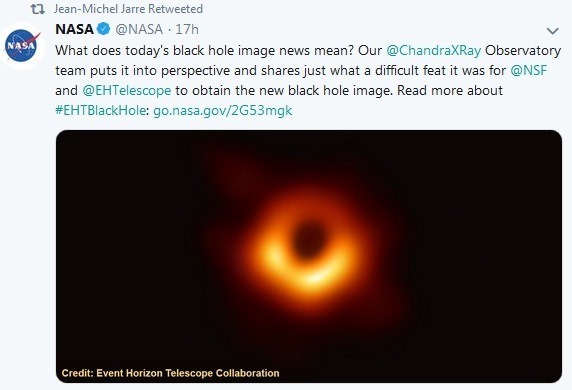 wow, that's pretty cool for them! Always been @Metallica fan !! Somewhat of a teaser of future project..? A lot of buzz going on in the media right now on how Metallica "will be back in the same shape again as when they released The black album" -1991. 7 years ago my mum France passed away.. still alive forever..! With Harrison Schmitt the last man on the moon (Apollo 17) and wife plus Charlie Duke Apollo 16. Great news dear Edward and the best possible Merry Christmas.! Just stopped by at Zenith on my way to Belgium to salute David Byrne and attend his fantastic show. A rare moment of perfection.! I feel sorry for the despair of the yellow vests. I want to cry in front of their loneliness. The state must make a gesture now, show more humanity. The Pride of power is the inverse of democracy. Not to hear is the true retreat of the rule of law.